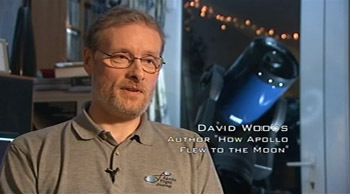 Through the production of the Apollo Flight Journal and the writing of both editions of How Apollo Flew to the Moon and the Haynes Lunar Rover Manual, David Woods has become deeply immersed in the detail of Apollo and of the Moon. His extensive knowledge and passion for his subject matter gives him the ability to deliver an incredibly authoritative and detailed presentation that will captivate any audience. He has contributed to many radio and television programmes, including Archive on 4 - Walking on the Moon for BBC Radio 4, Trusadh - A' Ghealach for BBC Alba and The Kirsty Wark Show for BBC Scotland. He is available to give talks on Apollo and the Moon and for further information on booking David, contact hafttm@ntlworld.com. © W. David Woods 2011-2015. Site Design by Kevin J. Woods.